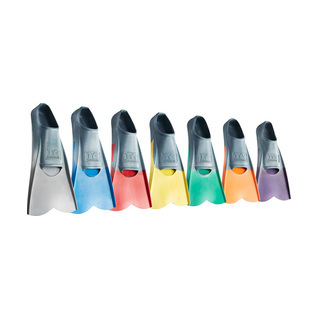 Tyr Crossblade training fins are intermediate length fins that provide the benefits of both short and long fin blade designs.These multi-purpose training fins accent speed and tempo while still creating resistance that builds power and improves technique during training sessions. Note: This fins sizes small so please consider going one size up! Note: For people using the European sizing chart please consider going two sizes up! Note: TYR Crossblade size XXL sizes EXTREMELY big, can be considered size 14-16! A bit long for training laps, but good for muscle strengthening. First time using Tri fins and I have naturally wide feet. I'm a Womans size 6 and they weren't too tight or too lose. Jusssst right! I'm excited to use them more. I love the green color too! Good quality fins, but my son likes Speedo more. My shoe size is 10.5 EEEE with a high instep. After trying fins in stores, I ordered these size XXL (13-15). They only fit by smearing vaseline inside. I think they'll be OK for my use, after a few more sessions 10-15 minutes at a time. But I don't understand this sizing. All the training fins I tried were the same. I decided to try Tyr's Crossblades, because various swim blogs suggested I should be using short blades, based on my goal of strengthening and toning, but without an overdose of resistance. (I tore my entire left adductor a few years ago, and have to be careful about overdoing resistance workouts.) As I had only used long fins, I could not decide. Crossblades seemed like an excellent compromise, and after my first workout with them, I am sure that I made the right choice. The fins are sturdy but not stiff; the fit is comfortable (as a women's 8.5-9, I ordered the M); and I do prefer them to the longer fins. One note on sizing: When I first put on the fins, the right toe bed and heel rubbed and squished a bit; all it took for a comfortable fit on both feet was for me to put the "offending" fin on the other foot. Problem solved, no rubbing or squeezing. Fins came fast, good quality, will put to good use.